The Oregon State Police provided this view of the Friday crash scene on Highway 34. Cables and other types of median barriers are fine and good, but what else could we try to keep drivers on their side of the road? At the Capitol in Salem this morning (Monday, April 6) the Senate business and transportation committee may act on a bill to encourage ODOT to install median barriers between opposing lanes on most sections of interstate highways in the next six years. The sponsors, including the Senate president and House speaker, call it the “Fritz-Fairchild Act” after the State Hospital psychiatrist and the counselor who died when a pickup careened across the I-5 median in Salem last Sept. 24 and hit their car. But all the bill says is that ODOT “shall make efforts to complete installation of median barriers” before Dec. 31, 2021. ODOT is doing that already in segments where crossover crashes have happened. Along I-5 in Linn County, the installation of a cable barrier is about complete. I only wish ODOT had acted sooner. In Linn alone, according to a newspaper report last October when there was another fatality, there were 35 crossover crashes from 2008 through 2013, resulting in four deaths and 43 injuries. But the problem is not confined, obviously, to interstates. “Roadway departure” crashes, including crossover head-on crashes, account for about two-thirds of all traffic deaths in Oregon. 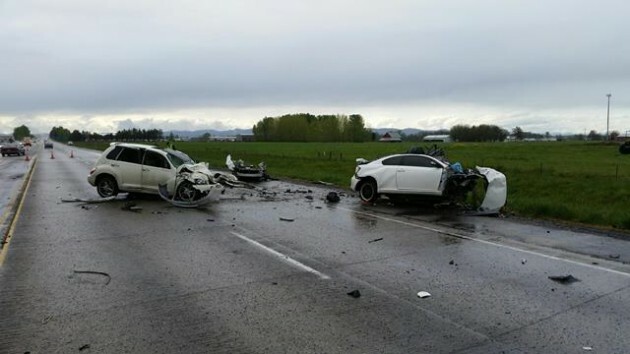 Just last Friday, the state police reported that a 24-year-old man from Roseburg lost control of his eastbound car on Highway 34 south of Albany and crossed into the westbound lane, hitting another car head-on. Both he and the other driver, a 70-year-old woman from Lebanon, lost their lives and an infant in the back seat of the man’s car was injured. We can’t expect ODOT to string cable barriers everywhere, especially on roads like Highway 34 where the travel lanes are separated not by a median strip but a left-turn lane. And of course on all two-lane roads, the only thing running down the middle is a painted line. Staying on he right side of the highway should be easy. All we have to do is pay undivided attention and keep our speed under control when curves are coming up. The fact is that too often, we don’t take driving seriously enough. I don’t know if ODOT or the legislature can do anything about that. Maybe rumble strips down the middle of most undivided roads would help by warning drowsy or distracted drivers when they drift into the oncoming lane. Perhaps the legislature could pass a law making it illegal to cross the center line. This way, we will know they are being productive. I think it’s a sad commentary that action (good or bad) doesn’t get done until “someone they know” is involved. Last summer we bought a new car with the latest electronic safety systems. I wanted that because I recognize that as I get older my driving skills will degrade. The new systems are a great improvement. A lane departure warning system beeps to let me know when I am drifting out of the center of the lane, or if I start to change lanes and a car is next to me. It also has a lane keeping function that will literally steer the car to keep it centered, and even steer through easy to moderate curves. The adaptive cruise control system will keep a safe distance (that I can set) between me and the car in front, braking or accelerating as necessary to maintain the separation. It can work at all speeds and is wonderful in stop and go congestion. The collision avoidance system will automatically actuate the brakes when a forward collision is imminent. The systems will get further refinements as time progresses. I am really glad I paid the money to get them. These systems will be standard in all new vehicles within the next few years, and I have no doubt that a lot of lives will be saved. That’s just great Bob. Now you can daydream while driving. Sounds almost as safe as texting and driving. We’ve “dumbed down” everything else in life. Why not driving too………..
Amen to Mr. Engel’s statement. The drive is the problem, not the roadway. The legislator from eastern Oregon who is pushing for higher speed limits says it should be done because cars are safer, safer brakes, air bags, etc. He is forgetting the loose nut that connects the steering wheel and the accelerator — that’s the problem. There are plenty of drivers on the road who are exceeding the posted speed now; raising it will just push them to drive a higher speed. Higher speed limits could be implemented state wide, but that doesn’t mean every section of highway would have a higher speed limit. One specific place where this would make sense is I-84 around the Boardman area. This tends to be long, straight stretches with light traffic. Personally, in these sections, I’d drive about 72 in a 65 zone. IF the limit was raised to 75, I’d drive 75 and be happy I can do 3MPH faster and not be looking over my shoulder for the police. Day/night limits could also be implemented with a 5MPH lower limit when dark.